This story was updated on April 17. April is when spring kicks into high gear. Baseball season is officially on hand, Easter and Passover bring families together, and our planet gets some much-needed love. Oh, and April is also when you can’t escape the tax man any longer. As with every month, you’ll find a smorgasbord of manufactured food holidays on the calendar too, many offering a chance for you to pick up something for nothing. Below are the most promising times to look for freebies this month, whether you’re an ice cream lover, baseball fan, coffee addict, or outdoor enthusiast. Many deals are announced only at the last minute, so bookmark this page and check back throughout the month for updates. Plus, put these nationwide promotions on your calendar. On Tuesday, April 9, Ben & Jerry’s is celebrating a holiday of its own making: Free Cone Day. At Scoop Shops worldwide you can line up for a free scoop (in a cone, of course) between 12 p.m and 8 p.m.
Lots of pretzel specialty shops celebrate National Pretzel Day on April 26 by handing out free pretzels. PretzelMaker, for one, will give rewards members a free original soft pretzel (salted or unsalted). If you can’t wait, sign up for PretzelMaker’s email list and earn a free pretzel right away. On what it’s calling “National Wetzel Day,” Wetzel’s Pretzels will give every customer who stops by one of its more than 350 bakeries a free pretzel. And you can follow them on Instagram until April 28 for a code for another freebie. If you’re near a Philly Pretzel Factory—a chain found mainly on the East Coast—you can stop by for a free pretzel on April 26. At Auntie Anne’s from April 26 through April 28, rewards members who buy a pretzel can take home an original or cinnamon sugar pretzel for free. What else to watch for? National Chocolate Mousse Day (April 3); International Carbonara Day (April 6); National Grilled Cheese Sandwich Day (April 12);, and National Cheese Fondue Day on April 11, when in previous years The Melting Pot restaurant has celebrated with special offers. In mid-April, the gas station and convenience store Wawa usually celebrates Wawa Free Coffee Day by giving out a free coffee of any size at its more than 790 locations across the East Coast (sorry, rest of the country). This year the event is happening on April 11. On April 10, Tim Hortons is launching a new rewards program, which lets members earn a free coffee, tea, or baked good on every seventh visit to the store. You’ll need a Tim Hortons rewards card or the Tim Hortons app to participate. A few days later, on April 16, Starbucks is revamping its rewards program, which the company says will help customers earn points more quickly for a wider variety of free things, from an extra espresso shot to Starbucks merch. Already a Starbucks rewards member? Don’t worry, your rewards points roll over automatically. To mark the beginning of National Park Week, which runs from April 20 through April 28, the National Park Service is waiving entrance fees at all parks on Saturday, April 20. Baseball season officially opened on March 28, but April is the first full month of games. You can score plenty of giveaways at your local stadium. The Boston Red Sox, for example, are marking the beginning of their 2019 season with a 2018 World Series ring for the first 7,500 fans that arrive at Fenway Park on April 11. The Chicago Cubs are giving away Star Wars blankets to the first 10,000 fans at Wrigley Field on April 13. Check out USA Today’s full list of top baseball stadium promos for a freebie near you. Earth Day is Monday, April 22, and along with messages about sustainability and eco-friendly practices you may come across opportunities to save money, or at least enjoy yourself outside. In some of the country’s biggest cities, bike share programs may let you take free rides on or near Earth Day. In New York City, Citi Bike has hosted an annual Car Free Earth Day NYC, offering discounts on an annual membership and free rides. Last year’s was on April 21, the Saturday before Earth Day. In 2018 Los Angeles gave out free Metro Bike Share rides on Earth Day. On Earth Day weekend last year, Ikea organized a “Make Room for Nature” event, which included discount offers, workshops, and giveaways for rewards members. Stay tuned. As you scramble to finish your taxes by the April 15 filing deadline, you can take solace in all the breaks businesses are offering. You’ll find $10.40 specials in honor of the Form 1040, including Boston Market’s half chicken meal and drink for $10.40 (get the coupon here) and 13 bagels with two tubs of cream cheese for $10.40 from Bruegger’s Bagels, a chain with locations in 22 states. 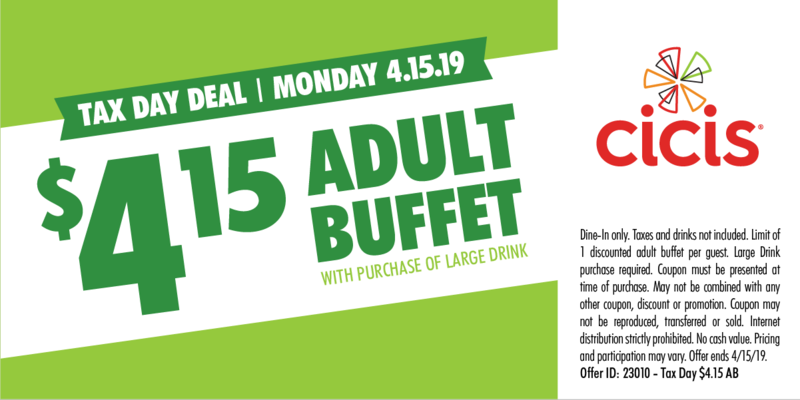 In another play on numbers, an adult buffet at Cicis is $4.15 on 4/15 with the purchase of a large drink. The pizza buffet chain has more than 400 locations across the country. White Castle will offer 15% off with a coupon sent to email subscribers and posted on social media. Buy-one-get-one free deals include a free entree at a PotBelly Sandwich Shop when you mention it’s Tax Day. 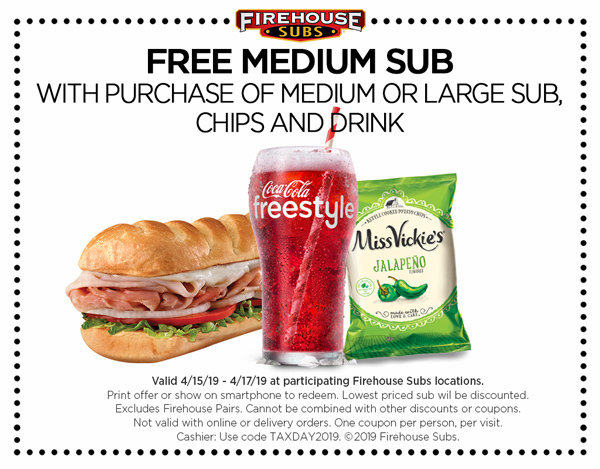 At Firehouse Subs, you can score a free medium sub when you buy a medium or large one with chips and a drink (download the coupon in advance). For outright food freebies on April 15, pick up an Original Chocolate Chip Cookie at Great American Cookies, a free Kona Ice on what the chain calls “Chill Out Day,” or a free turkey or veggie dog at Hot Dog on a Stick (one per customer limit). At Office Max and Office Depot, you can have up to five pounds of paper shredded for free through April 27 with this coupon. Does Tax Day have you craving a vacation? If you book on Orbitz on Monday, the travel site will refund any taxes you pay in the form of rewards points to use toward another trip. Need to relax NOW? Submit your email for a coupon from Planet Fitness that entitles you to a free hydromassage between April 11 and 20 (or a free chair massage if your club doesn’t offer the hydro version). Friday, April 26 is Arbor Day, a holiday that encourages everyone to plant trees. No tree to plant? The Arbor Day Foundation, whose mission includes making America greener, literally, by replanting the country’s forests, is sending 10 free trees to new members (with a $10 annual fee). Check your local garden club or home improvement store for Arbor Day freebies, which occur throughout the month. For example, The Cheerful Tillers Garden Club in Missouri is giving away 75 tree seedlings between 9 a.m. and 11 a.m. on April 5. Once you’ve planted that tree, add a home for all the birds that will enjoy it. This month’s free Kids Workshop at Home Depot is building a birdhouse on April 6. At PetSmart’s Sample Saturdays event this month—April 6 between 12 p.m. to 2 p.m.—you can collect free samples of dog and cat food for your pet. Later in the month, head to PetSmart on either April 13 or April 14 between 12 p.m. and 4 p.m. for a free family and family pet photo with another “animal”: the Easter Bunny. Ulta Beauty’s 21 Days of Beauty event runs through April 6. Along with plenty of discounted beauty and skincare products, you can also take advantage of the beauty company’s buy-two-get-one-free deal on mini versions of some of their best selling products.